Sharon Maneki reads a resolution in Braille at the microphone while Sharon Omvig listens. The section of the Declaration of Independence that is most familiar to Americans is the statement of principles: "We hold these truths to be self‑evident, that all men are created equal, that they are endowed by their Creator with certain unalienable rights, that among these are life, liberty, and the pursuit of happiness." Since the beliefs and objectives of the National Federation of the Blind are the same as those of the writers of the Declaration of Independence, it was most appropriate that the Resolutions Committee meeting at the 2002 national convention in Louisville was held on July 4. The resolutions passed by the Convention this year will further promote equality as well as life, liberty, and happiness for blind Americans. These resolutions may be divided into five categories: Braille literacy, education, rehabilitation, Social Security, and access. Once again this year Sharon Omvig ably served as secretary to the Resolutions Committee. The forty-one men and women on the committee considered twenty-six resolutions. Twenty-three resolutions came to the convention floor. Resolution 2002‑13, which urged the entertainment industry to seek out blind actors to portray blind characters, was defeated in committee. The committee did not oppose promoting the pursuit of acting careers by blind people but did not believe that blind people should be limited to portraying only blind characters. Resolution 2002‑26, which called upon Congress and the Bush administration to develop a national passenger rail service, was also defeated. Many committee members recognized the importance of good public transportation to the blind community but concluded that our resolutions should be reserved for issues that more strictly relate to blindness. Braille is an essential tool of literacy and communication for blind people. Throughout the convention, we held numerous discussions on the Unified English Braille Code (UEBC). The committee considered three resolutions. Resolution 2002‑03, which the committee killed, called upon the International Council on English Braille to "continue work toward the development of a set of proposed recommendations consistent with the Cranmer/Nemeth Principles that will gain widespread acceptance among Braille readers and provide for a systematic means of modifying the Braille code to meet current and future needs without compromising readability by current Braille readers." The resolution also stated that changes to the Braille code should eliminate duplication and minimize ambiguity. The committee passed two resolutions concerning the UEBC. In Resolution 2002‑04 we express opposition to any drastic changes in Braille. In this resolution we urge the Braille Authority of North America to retain its responsibilities for maintaining and improving current Braille codes. Curtis Chong, director of technology for the National Federation of the Blind, was the author of this resolution. Peggy Elliott, second vice president of the National Federation of the Blind and president of the NFB of Iowa, sponsored the other resolution on the UEBC. Resolution 2002‑05 calls upon the Braille Authority of North America and the International Council on English Braille "to cease and desist all efforts to make radical changes in the Braille code while the new circumstance of having readily available electronic textbooks is assimilated and understood." The new circumstance referred to in this resolution will come about when Congress enacts the Instructional Materials Accessibility Act. The Convention passed three resolutions to improve educational opportunities for blind students. In Resolution 2002‑01, introduced by Sheila Koenig, president of the National Association of Blind Educators and a tenBroek Fellow scholarship winner at this convention, we urge Congress to pass the Instructional Materials Accessibility Act during its current session. This legislation creates a process to make textbooks and other instructional materials available to blind and visually impaired students at the same time as they are provided to their sighted peers. When this legislation is enacted, standards will be developed for electronic file formats of books. Publishers will be required to provide these electronic files to a new repository, which will enable every school district in America to use the file to create instructional materials in alternative formats such as Braille for their blind and visually impaired students. Jason Ewell, first vice president of the National Association of Blind Students, sponsored Resolution 2002‑02. In this resolution we call upon Congress and state legislatures to enact legislation requiring that all instructional technology purchased by schools ensure the availability of non‑visual access. This resolution is necessary because more and more schools are using online courses and other computer-based learning tools. To avoid costly retrofitting, non‑visual access must be a requirement when course software is being developed. Resolution 2002‑19 was introduced by Michael Jones, president of the NFB of Alabama and a scholarship winner at this convention. In this resolution we express our opposition to H.R. 3252 and S. 1654, bills that would create a national junior college for deaf and blind students at the Alabama Institute for Deaf and Blind. Blind students have competed with their sighted peers in integrated colleges for decades. The creation of a special college for the blind would definitely be a step backward in education and would not prepare students for employment in an integrated setting. The Convention passed seven resolutions concerning rehabilitation. Three of these deal with services to the senior blind. Jim Marks, a longtime leader in the NFB of Montana, introduced Resolution 2002‑20. In this resolution we call for the design and implementation of high-quality, effective rehabilitation service-delivery methodologies specifically geared for older blind Americans. Government entities can no longer afford to ignore the growing population of seniors who are losing vision. These seniors could maintain independence if they received suitable services. In Resolution 2002‑06, introduced by Ron Gardner, president of the NFB of Utah, we urge Congress to adopt H.R. 2674, the Medicare Coverage Equity Act for the Blind. This bill amends Title XVIII of the Social Security Act to permit state rehabilitation agencies serving blind people age fifty-five and older to serve as Medicare providers and obtain reimbursement for the cost of rehabilitation. The resolution also outlines our opposition to H.R. 2484 and S.1967, which promote the delivery of rehabilitation services based on the medical model. Jim McCarthy, assistant director of governmental affairs for the National Federation of the Blind, sponsored Resolution 2002‑08. In May of 2002 new rules were enacted to permit occupational and physical therapists to supply rehabilitation services to blind people. Now Medicare funds can be used to reimburse these therapists. In this resolution we call upon the Rehabilitation Services Administration of the United States Department of Education to establish an ongoing training program on blindness for occupational and physical therapists so that these practitioners will be equipped to provide effective independent living services to older blind individuals. The Convention passed two resolutions that will strengthen the enforcement of informed choice. In Resolution 2002‑18, introduced by Shawn Mayo, president of the National Association of Blind Rehabilitation Professionals, we call upon Congress, when it re-authorizes the rehabilitation act, to prohibit practices by state rehabilitation agencies that thwart informed choice. 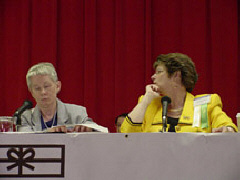 Noel Nightingale, a member of the national board and president of the NFB of Washington, was the author of Resolution 2002‑22. In this resolution we call upon the Rehabilitation Services Administration to revise its regulations to prohibit state rehabilitation agencies from undercutting informed choice. Some of the methods states use to thwart choice include the use of accreditation and certification requirements, approved provider lists, and in‑state training preferences. Resolution 2002‑24 addresses the need to eliminate a barrier to receiving rehabilitation services for blind people who receive Social Security benefits. Larry Streeter, president of the NFB of Idaho, sponsored this resolution. State vocational rehabilitation agencies may establish an order of selection in times of fiscal problems. This order of selection institutes a method of choosing which clients will be served by the state rehabilitation agency. Blind clients who are eligible for services can be denied these services when a state agency implements an order of selection. In this resolution we urge Congress to exempt blind individuals who receive Social Security benefits from any limitation of rehabilitation services imposed by an order of selection. Resolution 2002‑14 will help to improve the quality of rehabilitation services for blind people by enhancing the training of professionals who work in rehabilitation. A longtime leader in the Federation, Dr. Fred Schroeder, sponsored this resolution, which expresses our whole‑hearted support for the National Blindness Professional Certification Board. This board certifies professionals by using performance‑based criteria. The Convention passed three resolutions dealing with Social Security issues. The Social Security Administration is notorious for losing information and for delays in processing all aspects of claims. To remedy this situation, Carlos Servan, president of the NFB of Nebraska, proposed Resolution 2002‑11. In this resolution we call upon Congress to amend the Social Security Act to provide specific time limits for the Social Security Administration to resolve claims and disputes. If the Social Security Administration fails to meet the prescribed time limits, Congress should stipulate that the dispute will automatically be resolved in favor of the claimant. The remaining two Social Security resolutions deal with access to information. In today's society members of the public, including the blind, should be able to conduct all types of Social Security business online. The Social Security Administration makes the vast majority of its forms available in Adobe's portable document format (PDF) on the Internet. However, the pdf format is not accessible to many blind people. In Resolution 2002‑07, sponsored by Ryan Osentowski, secretary of the NFB of Nebraska, we urge the Social Security Administration to make all of its electronic applications and forms accessible to the blind. Anil Lewis, president of the NFB of Georgia and a scholarship winner at this convention, sponsored Resolution 2002‑17, which urges the Social Security Administration to provide notices and other information in alternate formats accessible to blind beneficiaries, including audio cassette, Braille, computer disk, and online, and to provide it at the same time as printed information is available. The Convention passed seven resolutions dealing with a variety of access issues. Due to advances in voting technology, blind citizens can now cast their votes independently and privately. The Convention passed Resolution 2002‑09 to make sure that the promise of this new technology becomes a reality in state and local elections. Dan Burke from Montana sponsored this resolution, which insists that state and local election officials consult with the National Federation of the Blind when configuring electronic voting systems. Curtis Chong, president of the National Federation of the Blind in Computer Science, sponsored Resolution 2002‑10. In this resolution we urge electronic book publishers to develop policies and procedures through which the blind can obtain access to electronic books. Resolution 2002‑15 outlines problems faced by Spanish‑speaking customers when using Freedom Scientific Spanish products. Although Freedom Scientific advertises that the Spanish version of its products is functionally equivalent to the English-language version, in reality it is not. Many features are missing while others are poorly designed. Alpidio Rolon, president of the NFB of Puerto Rico, was the author of this resolution. Robert Jaquiss, treasurer of the Science and Engineering Division of the National Federation of the Blind, sponsored Resolution 2002‑21. In this resolution we call upon governmental agencies and textbook publishers to conduct research into better methods of producing tactile graphics with the hope that they will become an integral part of the education of blind students. The use of point-of-sale machines is becoming more prevalent in transportation centers and retail establishments. Many of these machines now require the customer to interact by inputting identification numbers--a task which is impossible for most blind customers unless they have sighted assistance. Tami Dodd Jones, a longtime leader in the Federation, who currently resides in Indiana, introduced Resolution 2002‑23 to address these problems. In this resolution we call upon the United States Access Board to regulate the point-of-sale-machine market to ensure full accessibility and security for all customers, including the blind. Scott LaBarre, president of the National Association of Blind Lawyers, and Kevan Worley, president of the National Association of Blind Merchants, collaborated on two resolutions opposing draft guidelines issued by the Architectural and Transportation Barriers Compliance Board. Resolution 2002‑12 outlines our opposition to the universal installation of detectable warnings. Resolution 2002‑16 outlines our opposition to the installation of accessible pedestrian signals at all signalized intersections in America. The guidelines on both of these subjects issued by the Architectural and Transportation Barriers Compliance Board disregard both the recommendations of the National Federation of the Blind and the recommendations of its own Public Rights-of-Way Access Advisory Committee. The last resolution which the convention passed is Resolution 2002‑25. Mike Freeman, second vice president of the National Federation of the Blind of Washington, proposed this resolution. The American Council of the Blind filed a lawsuit against the secretary of the treasury of the United States and the treasurer of the United States alleging that the federal government is in violation of Section 504 of the Rehabilitation Act because it issues all U.S. currency in an identical size, color, and texture, which renders various denominations indistinguishable by touch. The American Council claims that blind persons are excluded from enjoying the benefits of monetary transactions because of difficulties with currency identification. Our resolution reads in part: this organization shall "take steps to counter the adverse effects of the harmful publicity arising from this lawsuit and renew efforts to educate the public that the blind can participate in commerce." This information is merely an introductory description of the resolutions considered and passed by the Convention. Readers should examine the complete text of each resolution to understand fully our policy on these subjects. The complete text of all resolutions approved by the Convention follows.